Received July 19th, 2011; revised August 9th, 2011; accepted august 24th, 2011.
the jaw in patients on bisphophonate therapy. are now more commonly used than before. approved for the management of osteoporosis. phonate use, and recent dental intervention. the potential sites of new infection removed. invasive procedure of the oral cavity. of jaw osteonecrosis has been estimated to 7% - 10% . 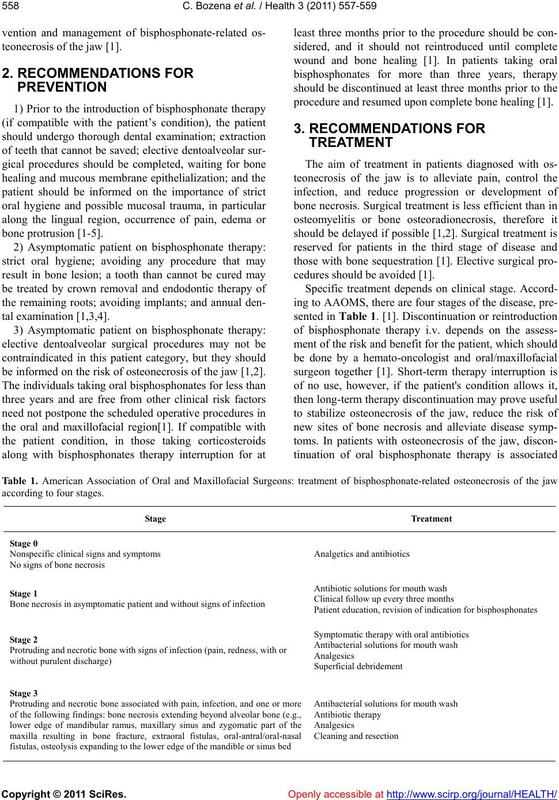 phonate exposure, and recent dental or oral surgery. the use of zoledronic acid than after pamidronate [4,6]. management of this rare and severe complication [1-3]. teonecrosis of the jaw . be informed on the risk of osteonecrosis of the jaw [1,2]. procedure and resumed upon complete bone healing . cedures should be avoided . tration or healing following surgical intervention . update. Australian Endodontic Journal, 35, 119-130.
cal practice. 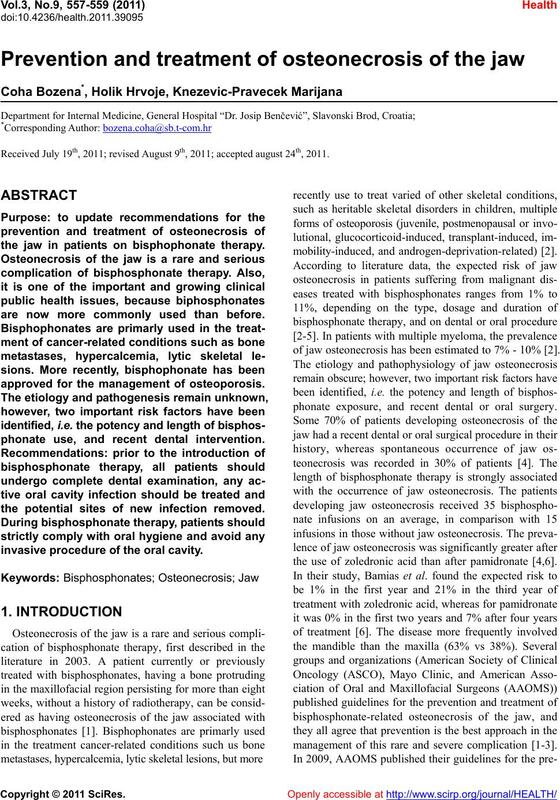 Mayo Clinic Proceedings, 83, 1032-1045.
date on the role of bisphosphonates in multiple myeloma. 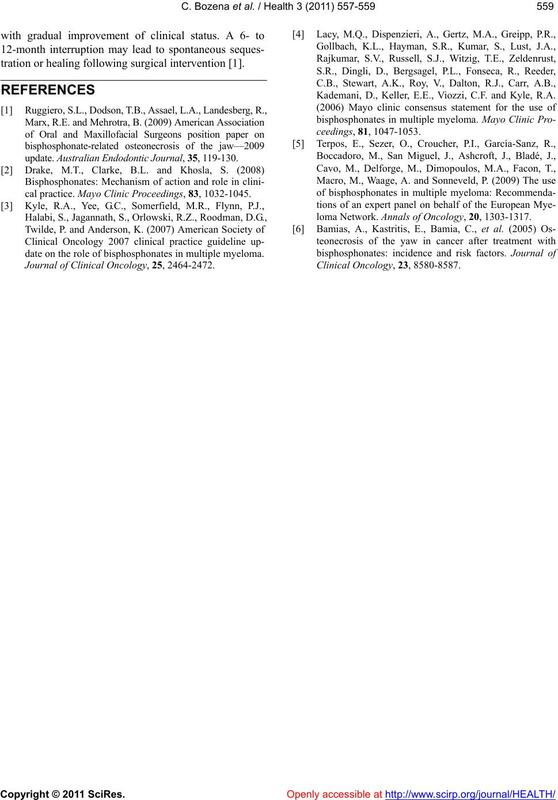 Journal of Clinical Oncology, 25, 2464-2472. Kademani, D., Keller, E.E., Viozzi, C.F. and Kyle, R.A.
loma Network. Annals of Oncology, 20, 1303-1317.